Bob Mason follows up the BASF Ferroscandia articles (MTI102 and 106) with an inglenook in 2'6" by 12". A very compact loco stabling point on the Soo Line in O scale, built and described by Jordan Foster. Editor builds a very small layout in Z gauge and provides a little background to the extent and potential of the scale. Editor looks at a few ways to minimise expenditure using other modellers cast-offs, with examples both British and American. Giles Barnabe recalls the unique isolated railway built to maintain harbour works, and latterly part of BR. Simon Hargreaves makes the ultimate in small portable layouts - one in N scale that fits in a violin case. A second look at this HOn3 compact project covers operating potential and some special cars related to those operating requirements. 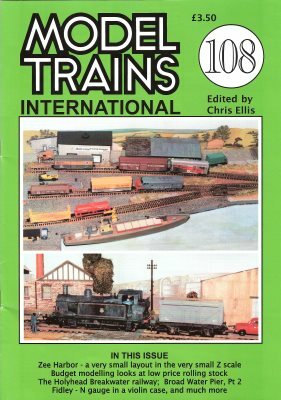 Edward Beal's other major article on modelling coaling stages for 4mm scale (OO) reprinted from the April and May 1936 issues of Model Railway News.